Directly connecting to Optical Pulse Counter with RPi? True, but that isn’t the “strangeness”. The strangeness is it jumped negatively as if it had received a large negative value, but then came back with an equal sized but positive value. One way to get negative numbers is an incorrect handling of signed and unsigned numbers somewhere along the way. If an unsigned number is copied into a signed number it works fine for the first half of the number range, then flips to negative once the upper bit becomes set. Is the timing of the point of error aligned with higher than average load? Can you zoom in closer and also check the csv via the graphs page? You are right that shouldn’t happen with the whaccumulator, this is the code for that process. Knowing why or how those datapoints are missing from the other feed might also shed some light on the events at the time, can you see if there are any clues in emonhub.log and if still none the wiser, add another feed in front of these 2 on the same input and make it a phptimeseries feed, you can delete it again in a few days or when you get to the bottom of the issue. PHPtimeseries will faithfully record all data points with the timestamp, so you can see exactly what data points arrived and when to get a clearer picture than looking at the fixed interval feeds. When I count pulses I tend to use a “Total pulse count to pulse increment” followed by an “whAccumulator”, it uses more disk space but it is IMO more dependable, more accurate and far easier to debug pulse counting because it is simpler code and the first process retains the incoming data to a feed (not the increment) and the second one records the new value (last value + increment passed from first process). // Save to allow next difference calc. You could try setting this method up to compare. first of all thank you very much for your very detailed answer with a lot ideas how to debug that! … it shows, also a slight change in value (from 3479.0 to 3478.5). Very good idea, added it and will report as soon as I have the data. Thanks for the hint, I added this as well to compare. In your opening post you say the “(it’s an emonTh in my case, feed: PHPFINA, interval 60s)” but the csv is at 5sec intervals. Can you confirm the data source/update interval and the feed types/intervals? is it just coincidence that both the csv examples fault for 12 x 5sec datapoints? Can you check another occurrence or 2 to see what the duration of the error is? At first glance I would of chanced a guess that this might have been related to the difference in intervals if you are sending data on 60s intervals and saving it on 5sec intervals, however that would only be visible in the graphs until you zoom in, so that’s unlikely. 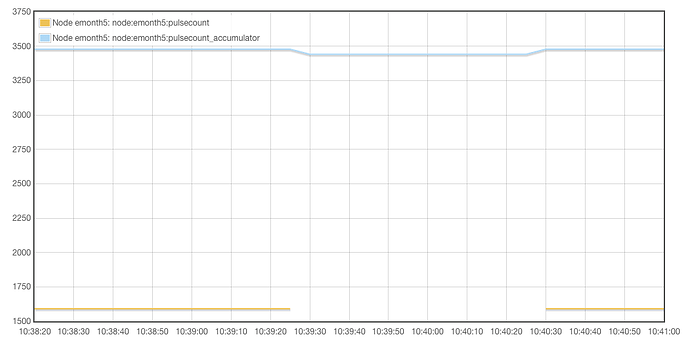 The whaccumulator csv also confirms the data is being saved every 5secs, but the pulse count seems to contradict that by recording null values ie it suggests the data was backfilled with null values once an input value was received. I also find it odd that the erroneous value returns to it’s previous value, it doesn’t drop back and continue to accumulate from the lower value, nor does it stay at the lower value despite no new increase, it simply corrects itself. 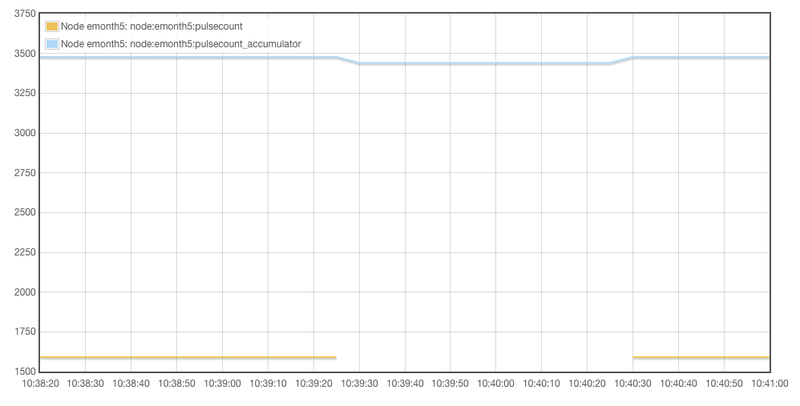 Is it possible you have rebooted the server or flushed redis so the last value was lost somehow? the nulls suggest a reset of some sort but I imagine a reset of the pulse count source would mean a return to zero, which doesn’t appear to happen. Hopefully the phptimeseries will give some insight. Can you confirm the data source/update interval and the feed types/intervals? I don’t understand why the graph/csv is showing values every 5 second. I don’t think it’s coincidence. The emonth is sending every minute (=12 x 5 sec) and the fault in the accumulated graph is only as long as the missing data gap. 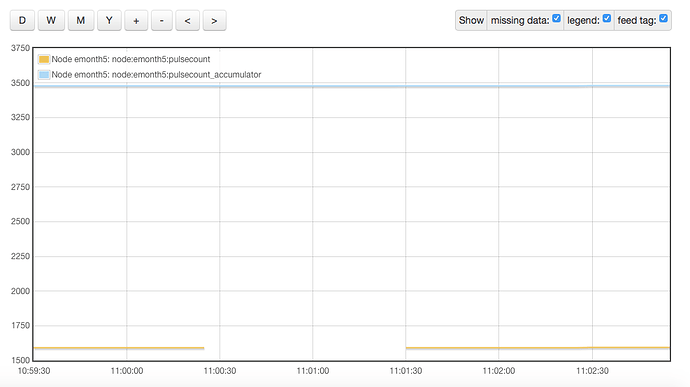 Is it possible you have rebooted the server or flushed redis so the last value was lost somehow? That data is a little misleading, that reports the uptime of the “physical server” ie the emonPi not the uptime of the actual “Apache server”, you could take your emoncms server offline for a week by shutting down the apache2 service and it would not impact the reported uptime. An example is updating the emonPi, each time you press the “Update emonPi” button on the admin page the apache server is taken offline whilst the update runs regardless of whether there is any updates to be had. 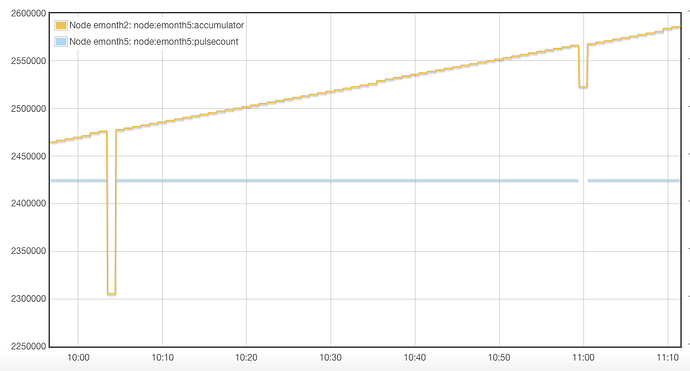 Also if you were to use the “flush” button in the redis section it wouldn’t effect the uptime. Although we now know (strongly suspect?) there is only one missing 60s pulsecount per occurrence that results in a both a null on the pulsecount feed and a single erroneous/reduced value on the whaccumulator feed, the latter still shouldn’t happen. We will probably have to wait and see what the phptimeseries feeds record if/when it occurs again. In the meantime keep a record of the times of any emonPi updates, reboots, power cuts or any other events that might impact the performance just to eliminate. Plus if you are really keen you could hunt out the emonhub log for the time(s) it missed a count to try and determine why it was missing. Not that knowing will change the fact emoncms should be able cope, but if you can reduce the occurrences until it’s fixed or invoke an occurrence whilst debugging, it might help. We will probably have to wait and see what the phptimeseries feeds record if/when it occurs again. I have now a day of values with at least 5 missing packets. 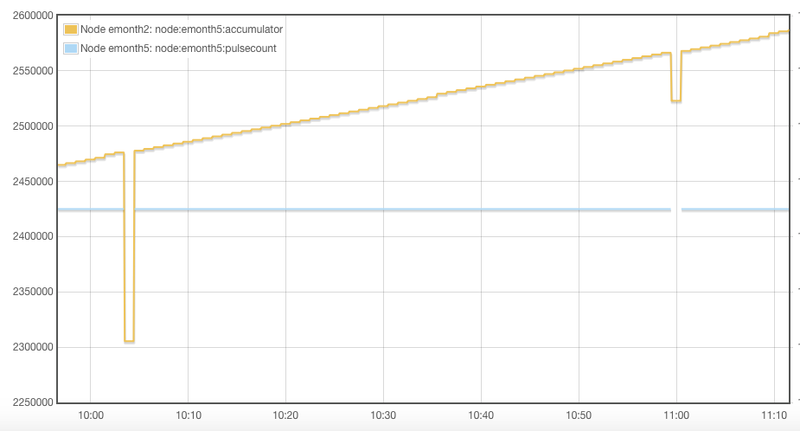 Like @pb66 suggested I added a timeseries feed to store the accumulated values. This feed is not showing erroneous/reduced values. Actually it shows nothing instead, because it does not log any values if no new packets arrive. So it seems that the actual feed values are not relevant. Can you post the phptimeseries csv and if it looks like data points are missing can you post emonhub.log for the same period too. Do you have quiet = false set in emonhub.conf [[RFM2Pi]] [[[runtimesettings]]]? it would be good to see if it is recieved but corrupt or too weak etc. Regarding the csv and the logs, you have given us csv for 23:55 to 00:03 and emonhub.log for 21:56 to 22:00 so there is no cross referencing, there is also no errors visible. Can you confirm if any TZ adjustment is included in the csv data? I was expecting raw unix timestamps. Be wary of passing csv of multiple feeds together this way as the graph module is a little quirky and only uses the timestamp of the first dataseries correctly. since you are comparing data produced in the same input processlist and stored in feeds of the same type you should be ok but when using different feed types or different intervals or results from different input processlists always run them separately and merge them yourself outside emoncms when debugging stuff like this. Also have you edited the emonhub.log? it doesn’t normally look like that and if you are sending to another instance that is not shown either. It is important to see the raw data (emonhub.log and phptimeseries csv with unix timestamps) and suspect processed data (whaccumulator) for the same period that demonstrates a “glitch”. Try setting quiet = true and we’ll try again tomorrow if it happens again. Can you confirm if any TZ adjustment is included in the csv data? Yes, sorry for that I use timezone +2, so emonhub log 21:00 (UTC) is graph module 23:00 (UTC+2). I will copy the raw UNIX-timestamps this time. Also have you edited the emonhub.log? I have a emonTx, sending every 5 seconds which blows up the log. I only deleted these lines. I will add the whole log this time. It is important to see the raw data (emonhub.log and phptimeseries csv with unix timestamps) and suspect processed data (whaccumulator) for the same period that demonstrates a “glitch”. New data, new luck This one is interesting, because it has two missing data packets behind each other which results in two different erroneous PHPFINA wh_accumulator values. 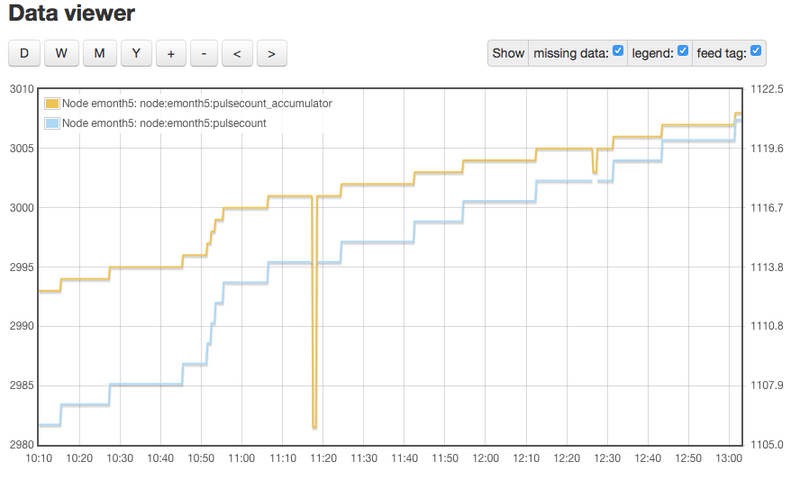 Well you can see the anomaly clearer when you compare the 2 phptimeseries feeds (left) with the phpfina (right), Every thing seem to be in order aside from the whaccumulator quite literally fudging the figures. You can see when the input was updated and that the regular phpfina backfilled with nulls, but the whaccumulator seems to have backfilled with something else, it dropped 10 off the first infill and 5 off the second infill. Later in the data the next occurrence only drops 1.5 from 4686.0 to 4684.5 so the amount isn’t consistent either. Perhaps @TrystanLea can take a look when he gets back from his Highland honeymoon, I will take a closer look at the whaccumulator code to work out how it is supposed to work, particularly when backfilling if I get a chance but right now I’m fried so it’s pointless trying.